Festival Santa Teresa will return to Quebec for its sophomore instalment this spring, and the lineup of performers has just been announced. Headlining the three-day event are Feist, Nick Murphy (f.k.a. Chet Faker), Lil Uzi Vert and Oh Wonder. 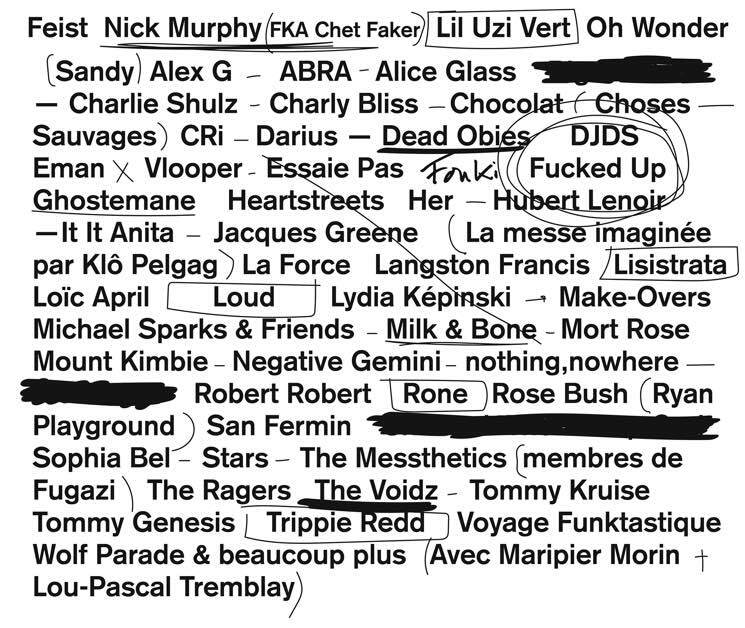 Plenty of other acts will round out the bill, including (in alphabetical order): (Sandy) Alex G, ABRA, Alice Glass, Charlie Shulz, Charly Bliss, Chocolat, Choses Sauvages, Cri, Darius, Dead Obies, DJDS, Eman Vlooper, Essaie Pas, Fouki, Fucked Up, Ghostemane, Heartstreets, Her, Hubert Lenoir, It It Anita, Jacques Greene, La mess imagine par Klô Pelgag, La Force, Langston Francis, Lisistrata, Loïc April, Loud, Lydia Képinski, Make-Overs, Michael Sparks & Friends, Milk & Bone, Mort Rose, Mount Kimbie, Negative Gemini, nothing nowhere, Robert Robert, Rone, Rose Bush, Ryan Playground, San Fermin, Sophia Bel, Stars, the Messthetics, the Ragers, the Voidz, Tommy Kruise, Tommy Genesis, Trippie Redd, Voyage Funktastique and Wolf Parade. The festival runs from May 18 to 20 in the Montreal suburb of Sainte-Thérèse. Tickets are on sale now, and you can find full festival information here.